Place magazine is a celebration of finding the right environment for today’s home or tomorrow’s investment, and all the personal and unique steps that each individual takes in that journey. We showcase some of our most exciting residential projects drawn from Todd Property’s master-planned communities and apartment projects. There’s something for everyone ranging from family living, to beachside neighbourhoods and prestige apartments. One of Auckland’s fastest growing communities is about to undergo a significant transformation, with the construction of a new $200 million-plus town centre being built from scratch in southeast Auckland. Plans have been unveiled for the Ormiston Town Centre, a newly created urban environment that will include retail stores, restaurants, a gym, movie theatres, a library, an aquatic centre, and a range of public open spaces that will connect to the neighbouring park. Built on a 4.5ha site beside Barry Curtis Park, construction is now underway for the 40,000sqm Town Centre, which will include 100 retail and commercial tenants, a three-level parking structure and four major anchor tenants, including The Warehouse, a HOYTS complex, the existing PAK’nSAVE, and an additional supermarket. Designed by NH Architecture of Melbourne and Jasmax of Auckland, the centre has a contemporary architectural design, setting it apart from traditional closed-in suburban malls, or big box retail developments. Instead, the Town Centre will integrate seamlessly into the urban landscape via streets, alleyways and public open spaces. Compact and pedestrian friendly, the centre will have a strong focus on food and entertainment, featuring a dining lane, a quality food hall, a restaurant precinct, along with an 8-cinema entertainment complex. “Ormiston Town Centre is not just about bringing retail to the area. It’s about creating new community spaces, where people can come together to eat out or just relax with friends and family, and its location next to Barry Curtis Park makes it very unique,” Mr Davies said. Todd Property Group is working in partnership with Auckland’s redevelopment agency Panuku to develop a 19ha site in Ormiston, which includes residential housing and the Town Centre. 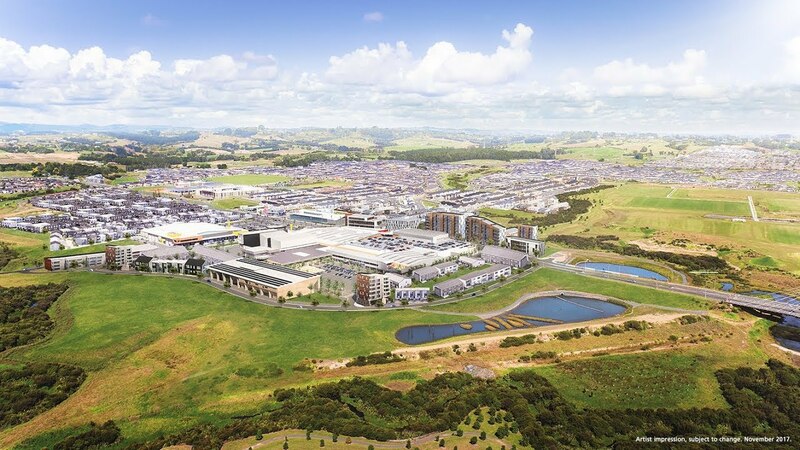 Located 24 kilometres from Auckland’s CBD, about two thirds of the overall Ormiston development has either been completed or is underway, including commercial spaces and 63 terraced homes, with another 66 under construction. The area has proved popular with families, with houses currently selling for between $650,000 and $950,000, depending on their size. Historically a dairy farming community, the population of Ormiston is predicted to balloon by 36,000 between 2013 and 2028 – the size of a town like Gisborne. Howick Local Board Chairman David Collings said community facilities were a priority for the Ormiston and Flat Bush communities, with a new library planned for the Town Centre and an aquatic centre, along with a variety of transport options, including cycle ways and bus facilities. Built by Scarbro Construction and Savory Construction, the Ormiston Town Centre is expected to open in 2020.